Any feedback please let us know. We will continue to update. Thanks. PDF Reader Pro can assist not only in uploading your desire PDF files to your iPhone through WiFi, but doing the file directory management. Moreover, it also provides big screen(landscape) document view for you. 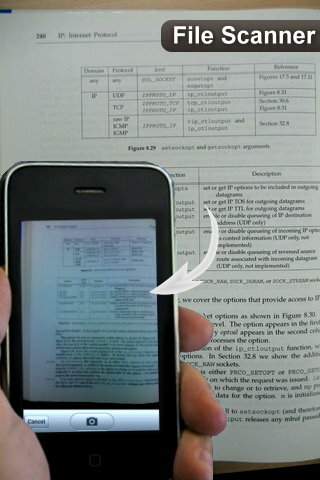 Now, document scanner feature is included! How could you miss this excellent tool!! Let’s download it now. ** When you are uploading your files, please don’t let your iPhone/i-Touch into sleep mode, and for the rotatiion and zoom in/out speed, it depends on your PDF files, if you have lots picture for each page, it will be slower. (1)After you download it, first you need to make sure that you have Wifi, and open Safari browser on iPhone to any website to see if your network works. (3)Open the browser on your desktop(not on iPhone), put the IP and port number as iPhone show you in your desktop browser, then upload and submit your files to iPhone. (4)After you uploaded files, You can click “Done” button on iPhone then you can browser your files. Please go to our website to read the HOWTO, if you still are confused with how to use it.